Cochin Shipyard Syllabus: Cochin Shipyard Syllabus and Exam Pattern for the posts of Fabrication Assistant, Outfit Assistant, and Ship Design Assistant is mentioned below. Kindly go through the article carefully. It covers details regarding the important subjects, paper pattern, total marks, and CSL Cut Off too. Applicants are requested to bookmark the page so that important updates and other latest details are not missed. Till now the Cochin Shipyard Syllabus and Exam Pattern are described in a brief manner. The same is mentioned below. As soon as we receive changes or update, you can see it right here. 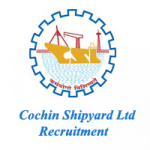 Total 195 vacancies are declared by the Cochin Shipyard Limited. They include 3 major posts namely Fabrication, Outfit, and Ship Design Assistant. All of these posts have various educations qualifications, selection methods, and pay scale. For more details please check the official Pdf attached and also our recruitment article linked at the end of the article. 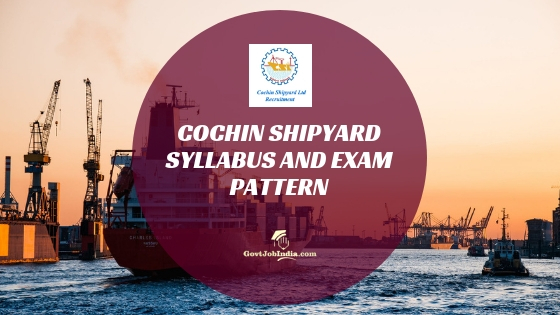 Cochin Shipyard Exam Pattern also differs from post to post the way it differs with the syllabus and other aspects. Ensure that all the details are checked thoroughly and you are not confused with the vacancies. In case of any confusion enter your questions in the comment section below. Our team will surely get back to you with relevant answers. For posts A to C the authority may come up with a minimum cut off regarding NTC marks. Post the same will be a document verification. Selected candidates after that will head towards the Practical Test. Any changes in the above procedure will be duly informed. Kindly check the official advertisement Pdf attached to know more about the Cochin Shipyard Syllabus, selection, and examination. Practical Test, Physical Test or Skill Test will be conducted based on filed requirement. Test conducted would be for 100 marks. Phase 1 – Objective Type online test (50 marks). Includes General(Part A) and Discipline rated(Part B) questions. Each question carries one mark and there would be no negative marks for incorrect answers. Final Selection will be of total 100 marks. Kindly check the official advertisement for more details and check the below Cochin Shipyard Syllabus for Post H to I, Phase 1, Part A. We believe the above details are sufficient enough to know all about Cochin Shipyard Syllabus 2019. Due to lack of few details you won’t be able to see them here. Once they are declared officially the same will be updated right here. Please feel free to enter any of your comments/queries or questions in the comment section below. Our team will surely get back to you with relevant answers. To receive or know more govt job opportunities around you, please visit our website @ govtjobindia.com.All the best!